Spin class is alive and thriving in South Carolina! This pumped-up workout is so much more than cycling. It’s a full-body workout that will leave you feeling good about the work you put into it, along with a chance to network and make new friends in every class. These 10 best spin classes in South Carolina can help you reach your body goals and have fun doing it. Their Wicked Cycle Boxing class is unlike anything you’ve ever experienced! Combining the calorie-torching benefits of cycling and boxing into a single workout, you’ll feel epically accomplished when your workout is finished. The dynamics here are on point and make you excited to get your burn on every time you visit. You can score a free VIP pass to try them out before you commit, but their spin class alone will sell you on a membership. They offer multiple days and times to accommodate your schedule, along with expert instruction to help you get the most from your workout. As a member, you can also take advantage of their other all-star classes like Zumba, yoga, barre, HIIT, and body pump. Their trainers are highly motivating and encouraging to help you complete your workouts with confidence. Spin classes are offered several times each week as part of their group fitness schedule. They include hills, sprints, and jumps throughout the workout to give you the same type of experience as riding on the road. Cyclists of all skill levels are welcome to join the fun here. Classes range from 45-60 minutes and vary in intensity throughout. The instructors help you every step of the way, including setting up your bike for your skill level so you can get the most from your experience. This class may take place on stationary bikes, but rest assured you’ll be moving the whole time! This weather-proof bike ride turns up the calorie burn and gives your metabolism the boost it needs to help you reach your fitness goals. The instructors here know how to keep it fun and exciting, whether it’s your first class or your 50th! Three locations give you three times the chance to join a spin class and improve your health. Their Group Ride class is every bit as good as cruising along two wheels in the great outdoors, except you don’t have to worry about traffic, weather, and bugs. You control the intensity of your workout, so you can go as hard or easy as you like. With over 250 weekly classes, there’s something for everyone here. The spin classes are top notch, with professional instructors that have a desire to see you succeed. Take your pick of traditional spin, or enjoy a challenge with their long, high-intensity Extreme Spin workout—90 minutes of heart-pumping action! 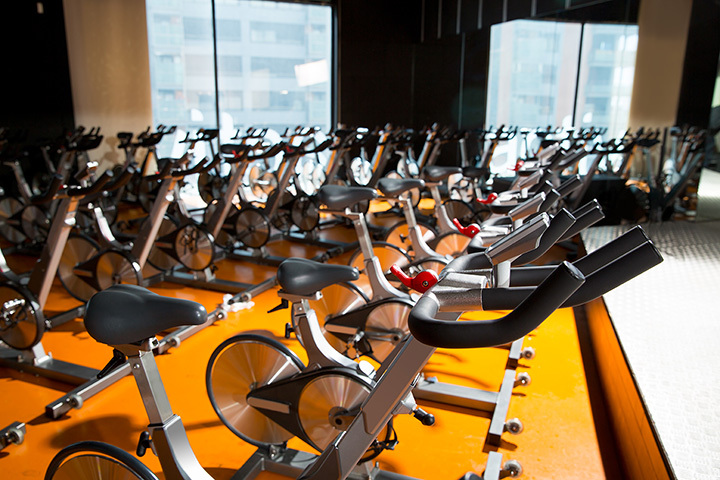 Take advantage of their free trial and take their spin classes for a, well, a spin! You’ll ride seated or standing through a journey of flats and hills while keeping your heart pumping and getting the workout you deserve. They keep it fun with lively music and a friendly atmosphere to give you the confidence to finish the ride strong. By far one of the best groups of fitness centers in the state, the folks here want to see you reach your goals just as much as you do. Their spin classes offer a fun yet challenging workout that will help you boost your energy and burn calories. With three levels of cycling classes to choose from, you’ll hit your target in no time. This gem of a gym is a hometown favorite for many reasons, but their group classes keep members coming back. Spin classes are offered several times per week so you can stay on a workout schedule or simply join when it’s convenient. And since it’s a 24-hour gym, you can cycle ‘til your heart’s content, even when class isn’t in session.